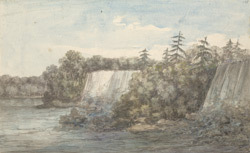 Watercolour of the Great Fall at Niagara. The falls are situated on the Niagara River at the border between Canada and America and drain four of the American Great Lakes into Lake Ontario. The waterfall is actually made up of three separate cascades- the America Falls, the Bridal Veil Falls and the Horseshoe or Canadian Falls, and collectively they are known as Niagara Falls. The falls were first discovered by the explorer Father Louis Hennepin (c.1640-c.1701) in the 17th century. This watercolour is typical of an item from the King’s Topographical Collection in that it depicts a site of topographical interest in the British colonies.